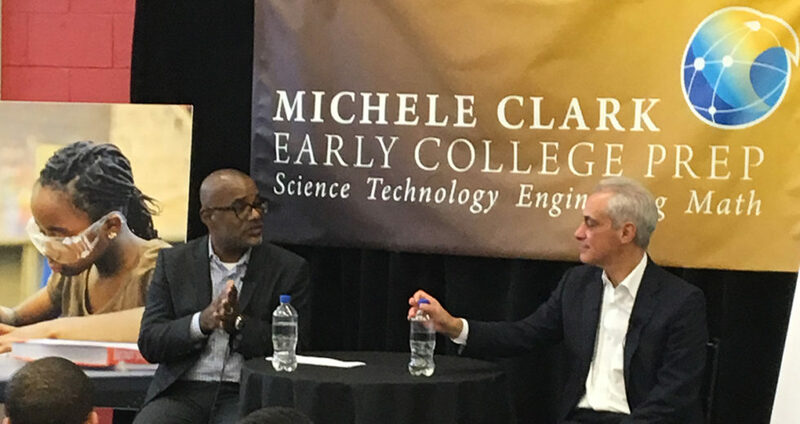 Chapin Hall Executive Director Bryan Samuels interviews Chicago Mayor Rahm Emmanuel at the launch of the Chicago Youth Quality of Life Framework project. The City of Chicago released its Youth Quality of Life Framework, a tool to set goals for youth well-being and identify programs that have the most positive impacts on the city’s youth. Chicago youth succeed in school and engage in meaningful post-secondary options. Chicago youth are safe in their communities and in their homes. Chicago youth have healthy relationships with themselves and others. Chicago youth are physically healthy and have access to resources to maintain their health. For each domain, the team identified existing metrics that will be used to monitor progress, with an accompanying list of programs designed to support that success. (See these details in the complete report.) The goal of the framework is to develop clear goals for future budgets and policies that will positively affect youth. “Community-wide partnerships are critical to ensuring that our children have the best possible chance to succeed,” said Chapin Hall’s Director of Research Dr. Anne Farrell, who led Chapin Hall’s work with this coalition. Dr. Forrest Moore, Emily Wiegand, and Dr. Jennifer Axelrod also contributed to this work. Chapin Hall experts contributed to determining the best metrics to track for different age groups and domains, such as physical health and education. We then engaged community stakeholders to help us prioritize indicators that are most relevant and actionable.